Brek-Ridge Horse Show big summer success ! Saturday, June 21st, on the summer solstice ‘the sun appeared to stand still in the sky’ for the horseback riders competing at Brek-n-Ridge Farm’s first 2014 summer event, the Stepping Stones Horse Show. The unaffiliated equestrian club in Northwestern Michigan is committed to having fun while advancing proficiency in the dressage and jumping arenas. Brek-n-Ridge barn and farm managers Kate Etherly and Greg Last with help from Andrew Figures and Gail Miller ran a smooth and polished dressage show. A total of 46 entries competed with riders coming from Traverse City and barns in the outer regions of Harbor Springs. Starting at 9 am and ending mid afternoon, the judge Kari Merz of Black Star Farms in Traverse City made it home for dinner! “It was our most successful show in the 4 years we have been here. In the shade of our big trees we have a small park with picnic tables. Brek-n-Ridge is a small stable yet we were able to offer many of our guests a box stall. Some riders stayed overnight and went for a trail ride we organized.” Says Karin Offield the farms owner. The riders included Brek-n-Ridge Farm’s summer working students and clients whose early arrival for summer fun included MacKenzie Becker and Mary Otto; and locals equestrians Quinn Mathews, Beth Harwood, Savannah Thompson, Hannah Neff, Beth Straebel, Oona Owen, Anna Ketko, Kat Nekhorn, Mary Louise Mooradian, Susan Burns, Kathy Zimmerman, Marni Cameron, Karin Offield and Ann Truffant. the daughters of the Beckett Family that own and operate Tapawingo Farms in Sault Ste. Marie. The Introductory Championship went to a 15 year old black Dutch Friesian horse named Ulke. He earned the high score of the day of 66.8%. 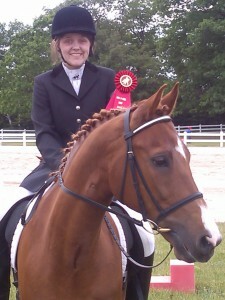 Rider Karin Offield says, “He has now earned his way into the canter divisions. At his first show he scored a 67.5%. He has been a four-year project of mine to teach him to become a suitable riding horse. He is the most amazing creature. I love him.” The Training Level Championship went home with Mary Louise Mooradian riding her own Bubba.